Valley of Fire Weddings is a unique outdoor wedding location, located about 1 hour northeast of The Las Vegas Strip. Valley of Fire is Nevada's oldest and largest state park, dedicated 1935. The valley derives its name from the red sandstone formations and the stark beauty of the Mojave Desert. Ancient trees and early man are represented throughout the park by areas of petrified wood and 3,000 year-old Indian petro-glyph. The park offers a full-scale visitor center with extensive interpretive displays. The park is open all year. 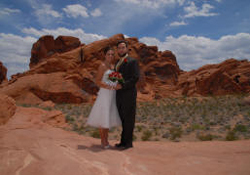 The Valley of Fire State Park offers a variety of locations for your wedding ceremony. The Rainbow Vistas are popular for that sunset ceremony. Looking for the ultimate secluded location? Only a short few minute walk from the Visitors Center, this location is surrounded by rock formations yet is still quite suitable for that sunset ceremony. Additional locations include 7 Sisters and The Cabins. From pick up to drop off, plan on 3.5 to 4 hours. 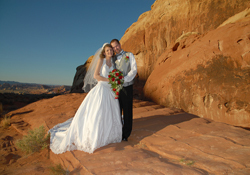 Please view our Valley of Fire Wedding packages below for prices. If you have any questions please call or email. Deposits to Reserve: Deposits are due at time of reservation and are subtracted from package price. Minimum 2 days notice for Valley of Fire Weddings. Minister services included. Drivers work for tips $75.00 and up suggested. 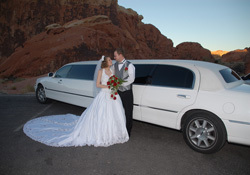 Limousine service from your hotel, (Strip vicinity or Downtown) area, to The Valley of Fire and back to your hotel. Prices do not include tax or $10 handling. Additional $100 for Saturday ceremonies, holidays, and specialty days, (Valentine's Day, 12/13/14). Balance due 7 days prior to ceremony date. Full payment required for ceremonies made within 7 days of ceremony date. If not staying on The Strip or downtown, and unsure if your hotel is in our service area, please call. Copyright 2014 All Rights Reserved. Chapels of Las Vegas, Inc.